A Tribe Called Quest, Fu-Schnickens, Lyvio G.
F.U. 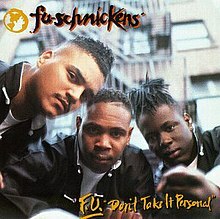 Don't Take It Personal is the debut studio album from American hip hop group Fu-Schnickens, released February 25, 1992 on Jive Records. Recording sessions for the album took place at Battery Studios in New York, New York. The album peaked at number sixty-four on the Billboard 200 chart. By late 1992, it was certified gold by the RIAA, for shipping 500,000 copies in the United States. The album was recorded at Battery Studios in New York, New York. F.U. Don't Take It Personal peaked at sixty-four on the U.S. Billboard 200 and reached the thirteenth spot on the R&B Albums chart. The album was certified gold in 1992. In The Village Voice, Robert Christgau praised Fu-Schnickens' ideas and illusory rhymes, calling the group "rappers whose visions of fun, agape, and aural conquest remain open-ended, playful, and, face it, silly". Stanton Swihart at Allmusic wrote in retrospect that "although their fashion sense (kung fu outfits on the cover) and taste in influences may have initially painted them as a novelty, their approach to music was straight serious on this debut album, and it shows." production – A Tribe Called Quest, Fu-Schnickens, Lyvio G.
^ a b "allmusic ((( F.U. Don't Take It Personal > Review )))". Allmusic. Retrieved 2010-04-10. ^ a b Christgau, Robert (July 28, 1992). "Consumer Guide". The Village Voice. New York. Retrieved October 27, 2015. ^ a b "allmusic ((( F.U. Don't Take It Personal > Charts & Awards > Billboard Albums )))". Allmusic. Retrieved 2010-04-12. ^ "American album certifications – Fu-Schnickens – Take It Personally". Recording Industry Association of America. If necessary, click Advanced, then click Format, then select Album, then click SEARCH. ^ "allmusic ((( F.U. Don't Take It Personal > Charts & Awards > Billboard Singles )))". Allmusic. Retrieved 2010-04-12. ^ "allmusic ((( F.U. Don't Take It Personal > Credits )))". Allmusic. Retrieved 2010-04-11. "What's Up Doc? (Can We Rock)"
This page was last edited on 3 November 2018, at 19:05 (UTC).